Registration is now open for the September 12th Pasture Management Workshop! This pasture management workshop will offer educational presentations, a pasture walk, and dinner. In addition to the workshop, equipment dealers will showcase the latest in forage harvesting and forage handling machinery at the event. Admission is $10 and open to the public. For accommodation purposes, advance registration is appreciated by September 5. Mark your calendars and RSVP today! Special Opportunity for High School and College Students to learn about Agriculture, Livestock, and Pasture Management from 1 p.m. to 2:30 p.m. Cost: $10 includes educational materials, pasture walk, and dinner provided by Greene County Cattlemen’s. 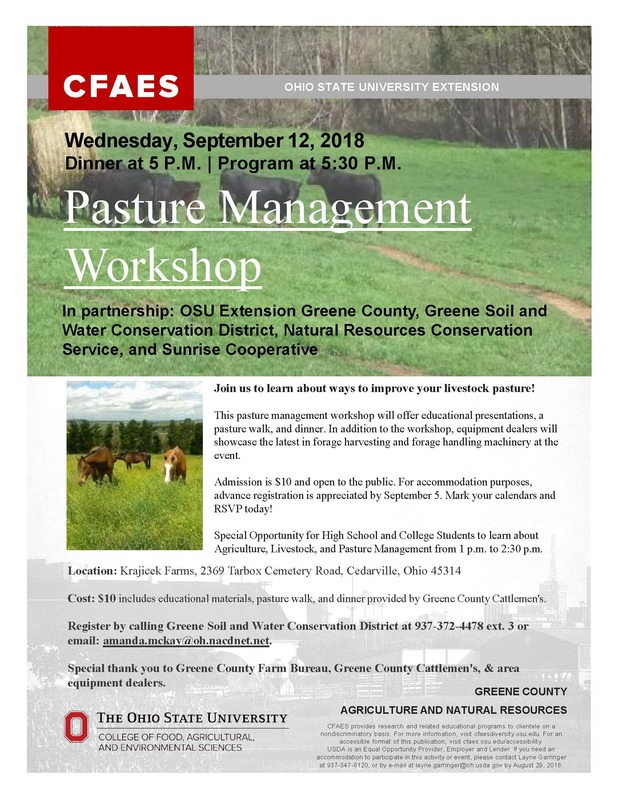 Register online at go.osu.edu/PastureManagement or by calling Greene Soil and Water Conservation District at 937-372-4478 ext. 3 or email: amanda.mckay@oh.nacdnet.net. Special thank you to Greene County Cattlemen’s, & area equipment dealers. Posted in Agriculture and Natural Resources, OSU Extension Greene County	Tagged Pasture Management	Bookmark the permalink.